Bankruptcy and insolvency law intersects with virtually every practice area, with insolvency-related issues being raised in litigation, pensions, employment law, securities, taxation, and mergers and acquisitions. 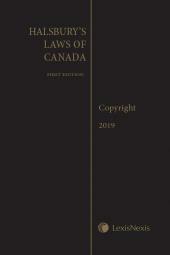 Halsbury's Laws of Canada – Bankruptcy and Insolvency (2017 Reissue) provides a current and comprehensive review of the administrative structures of the Bankruptcy and Insolvency Act and Companies' Creditors Arrangements Act. 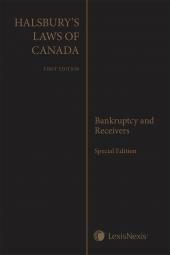 Written by a team of leading insolvency practitioners, this volume will assist both specialists in this area of law and those for whom bankruptcy and insolvency law is an overlapping field. Hon. Yoine J. Goldstein, B.A., B.C.L., D.E.C.D., D. de l'U., Ad.E., LL.D. 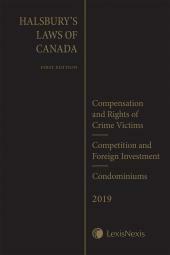 (General Editor), is the senior legal consultant at McMillan LLP. Formerly a Canadian Senator, he has been elected a fellow of the American College of Bankruptcy, the Insolvency Institute of Canada and the American College of Trial Lawyers. He continues to be involved in major commercial restructurings, pleads commercial and bankruptcy cases at all court levels and continues to lecture and publish in the field of bankruptcy and insolvency.